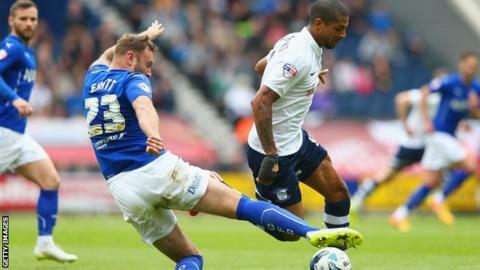 Evatt claimed he was attacked after the Spireites were beaten 3-0 in the second leg of their play-off semi-final at Deepdale to lose 4-0 on aggregate. "To be attacked on a football pitch and fear for your safety is an absolute disgrace." Chesterfield said the defender had given a statement to police "following an alleged assault as he left the pitch, surrounded by fans". Lancashire Police confirmed to BBC Sport that a Chesterfield player had contacted them to report an alleged assault. Preston, whose supporters celebrated a first trip to Wembley in 21 years by pouring onto the pitch at the final whistle, are yet to comment. Evatt played for Blackpool for six years from 2007 to 2013 and helped the club win promotion to the Premier League. Chesterfield assistant manager Leam Richardson said Evatt's time at Blackpool was no excuse. He said: "The rivalry, you can't underestimate that, but to lay hands on people as supporters is a disgrace." Evatt told BBC Radio 5 live that he was surrounded by "a couple of hundred fans at least, shouting abuse, spitting". He added: "Something needs to be done about it. The more it goes on, the more likely there will be a serious offence and a real serious injury to a player." A spokesman for the Football Association confirmed it is "aware" of the incident and said: "We will wait for the relevant reports to come through and will then speak with both clubs and the police." Inspector Steve Bradshaw, of Lancashire Police, said: "While the player was thankfully not seriously hurt, police are investigating the assault, including reviewing CCTV footage." "There was a surge of people on to the pitch at the final whistle and most of the players were quickly engulfed. "The allegations made by Ian Evatt, who was the subject of chanting from PNE fans at different times during the game, obviously paint the pitch invasion in a very poor and disgraceful light. "That said, there did not seem to be much malice or intent to harm from the vast majority involved. Dads wandered on with their children and took photos with their camera phones and fans gathered in both goals to pose for photos, while the penalty spot at the end Preston attacked in the second half also proved popular."